Almost two decades after its discovery, EPCs still remain controversial. 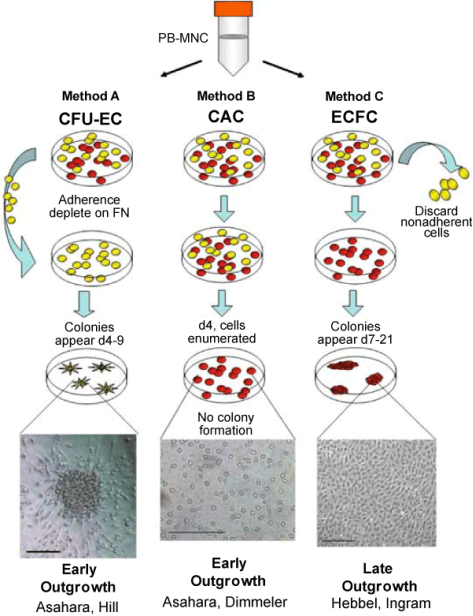 Several reports show the potential of EPC as a regenerative tool due to its overlapping phenotypical and functional properties with hematopoietic cells and mature endothelial cells. However, contradicting results has been obtained from in-vivo clinical trials. (Timmermans et al., 2009) Despite of being extensively studied there are still difficulties in characterization, identification and definition of EPCs due to the heterogeneity among the population and the inexistence of a unique identifying marker. (Lee et Poh, 2014). This review will look at the current understanding of EPCs including the subsets that composes the population, the variety of roles they play in neovascularisation, techniques used in defining EPCs, characteristics in-vitro and in-vivo and the attempts to use EPCs as therapeutic and diagnostic tool in clinical trials regardless of the problems in translating research evidence into clinical use. How to define an EPC? 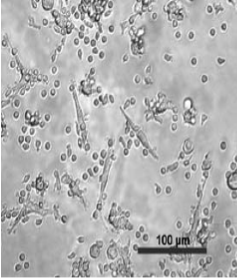 3.a EPC characterization through cell culture assays. ‘true EPCs’ must also have the ability to differentiate into endothelial cells both in vitro and in vivo. Figure 1. Schematic overview of standard protocol used for EPC isolation. Markers expressed by late-outgrowth EPCs more similarities to endothelial cell markers. After 7 days in culture. After 2-3 weeks in culture. "Endothelial Progenitor Cells Characterization and Role." UKEssays.com. 11 2018. All Answers Ltd. 04 2019 <https://www.ukessays.com/essays/biology/characterization-endothelial-progenitor-7647.php?vref=1>. "Endothelial Progenitor Cells Characterization and Role." All Answers Ltd. ukessays.com, November 2018. Web. 23 April 2019. <https://www.ukessays.com/essays/biology/characterization-endothelial-progenitor-7647.php?vref=1>. UKEssays. November 2018. 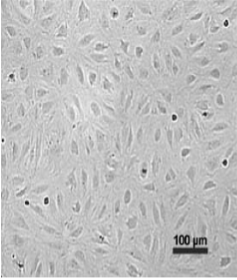 Endothelial Progenitor Cells Characterization and Role. [online]. Available from: https://www.ukessays.com/essays/biology/characterization-endothelial-progenitor-7647.php?vref=1 [Accessed 23 April 2019]. UKEssays. Endothelial Progenitor Cells Characterization and Role [Internet]. November 2018. [Accessed 23 April 2019]; Available from: https://www.ukessays.com/essays/biology/characterization-endothelial-progenitor-7647.php?vref=1.